Capacity crowd of 52,000 have crammed into St James Park and the atmosphere is popping. Carter kicks off and Tonga have early possession. Tonga progress over halfway but then turn the ball over. Aaron Smith puts up a huge midfield bomb which Tonga deal with well. Tonga are back on the attack as they move up over the 30m line. Good start from Tonga, they are having plenty of early touches. PENALTY AGAINST TONGA: Good work at the breakdown from Kieran Read has earned the ABs a penalty inside their own half. ABs win the lineout and Nonu hits the Tongan line at pace. Good phase this from the All Blacks as they move up to the 22. 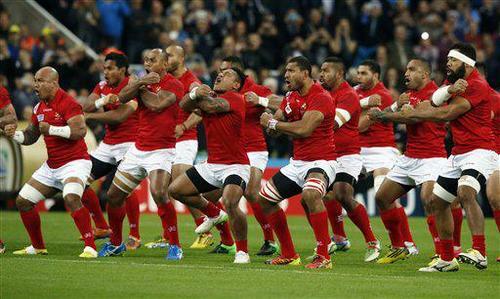 Great defence from Tonga. The ABs could find no way through and eventually Tonga were able to clear. 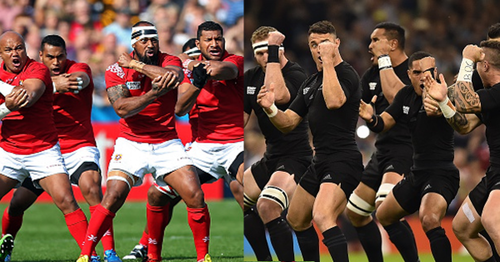 But it doesn't take long before the All Blacks are back on attack. Tonga aren't giving an inch on defence though. The ball is loose and Tonga clear. Takulua boots it long downfield. Smith scampers back for the ABs to mop up the danger and clears for touch. Tonga overthrow the lineout and it's snapped up by Dane Coles. But Tonga turn it over just as quickly. It's been a good even start here, Tonga have given as good as they have got in the first 6 mins. Aaron Smith puts up another huge bomb, that looks a popular AB tactic, but once again Tonga deal with it well. TURONVER: Plenty of Tongan pats on the back as they turn the ball over and earn a scrum. 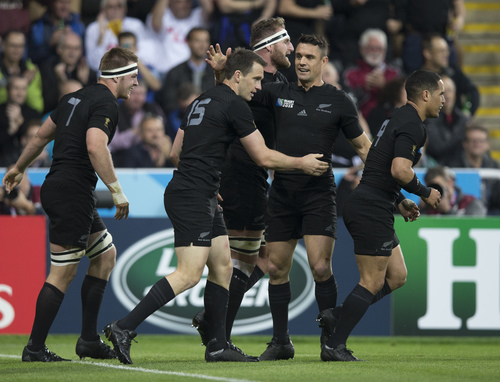 MIlner-Skudder was tackled and Tonga dominated the breakdown, forcing an ABs knock on. 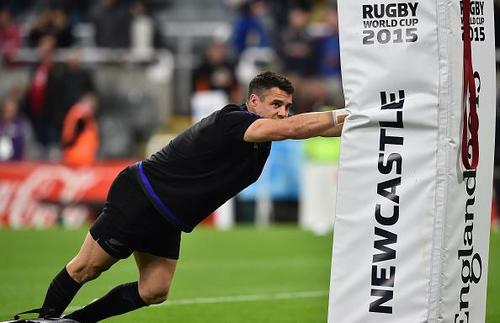 Congratulations to the All Blacks for getting Dan Carter to the 4th game of a World Cup for the first time in 8 years too! PENALTY TO TONGA! The back pats have turned into high fives. A powerful scrum from Tonga has earned them a penalty. 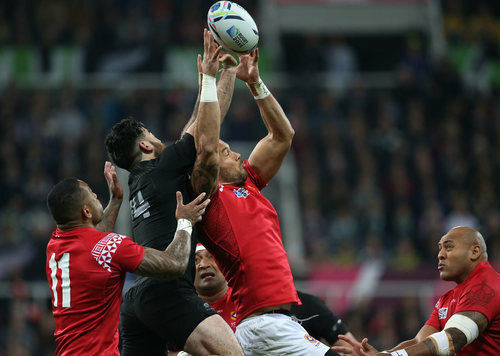 Tonga have a lineout on halfway but they lose it again and the All Blacks quickly counter. TRY ALL BLACKS! Ben Smith has scored the first try of the match. Quick hands on the right wing, some wonderful interchanges of catch and pass worked the ball to Smith who powered past a Tongan defender to score. Good try from the All Blacks and that should help them settle into this one. Carter slots the conversion from wide on the right and the ABs have 7-0 lead. Tonga are looking to quickly respond and have good field possession 30m out. But they lose the ball forward at the breakdown. All Blacks scrum. ABs run the ball off the back of the scrum. Nili Latu is offside and the All Blacks have been awarded a penalty. It's right on halfway but Dan Carter opts to kick for touch. 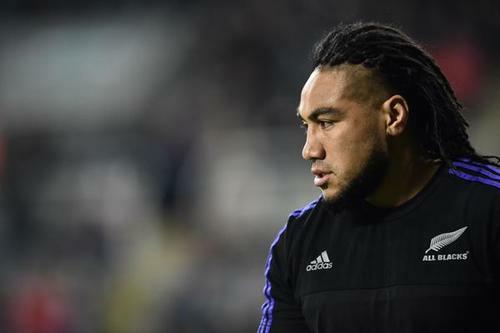 The ABs take the lineout well but Ma Nonu quickly loses the ball forward in the tackle. Tonga scrum. Tonga clear through Morath but it's straight down the throat of Naholo and the ABs run it back at pace. But once again, the All Blacks attack comes to nothing. Another ABs knock on. Tonga's defence deserves some real credit here, they have been stubborn and excellent but once again, it seems this ABs attack isn't quite gelling the way it should.